Farm equipment is often heavy, bulky, hard to move, and could require two people to safely lift or move items, or to hitch equipment to a tractor. A good alternative to back-straining lifting is a rolling lift cart. Rolling lift carts reduce the risk of injury from lifting and carrying heavy objects. 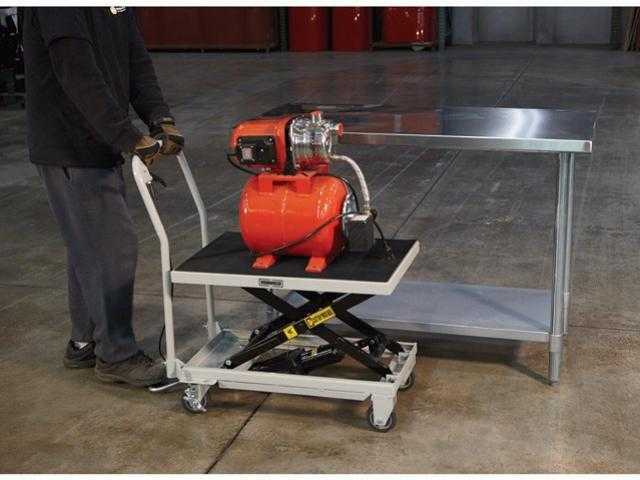 A rolling lift cart allows you to lift an object from the floor, bench, or table with minimal manual lifting, and move the equipment to where you want it and raise or lower the height of the cart to allow easy attachment or transfer of the equipment. A lift cart can be used to unload heavy objects from a truck bed and move them where you want within the shop or barn. The lift table height is raised with a foot pedal and lowered with a hand release lever. An Ohio AgrAbility client who has back and neck pain and lifting limitations has used a rolling lift cart to transfer a heavy 3 point quick hitch from the shop floor and over to the tractor’s lift arms. He can use the cart to lift or lower the quick hitch to the desired height to slide the pins into the lift arms, without needing to climb in and out of the tractor to raise and lower the lift arms. The farmer told Ohio AgrAbility staff that he uses his cart almost every day, and if his cart broke, he would replace it immediately. He said it increases his independence, productivity, and has saved him from further pain and injury to his back and neck, which allows him to continue working. Farmers of any age and ability can benefit from a rolling lift cart, not just farmers with disabilities. A correctly used rolling lift cart can decrease the risk of injury from lifting, lowering or carrying objects, and minimizes the chances of dropping heavy equipment on yourself or the shop floor. It can also make hitching equipment without help easier. Lift capacity of the rolling lift carts ranges from 500 to 2,200 pounds, depending on the brand and model, with prices ranging from $250 for 500 pounds of lift capacity, at disAbilityWorkTools.com, to $510.00 for 2,200 pounds of lift capacity at Northern Tool and Equipment. Ohio AgrAbility does not receive any payment or benefit from these companies, these carts are listed to provide examples of the equipment, not to advocate for a particular product.